WebScanning is an App that has been specifically designed for use with EventReference and WebBadging to enable you to get the most out of your event. All you need is an Android device and a Bluetooth scanner. Get fast on-site printing with Scan and Print. If you have sent your delegates/attendees an e-badge containing their barcode you may want to scan them on arrival and produce their badge. 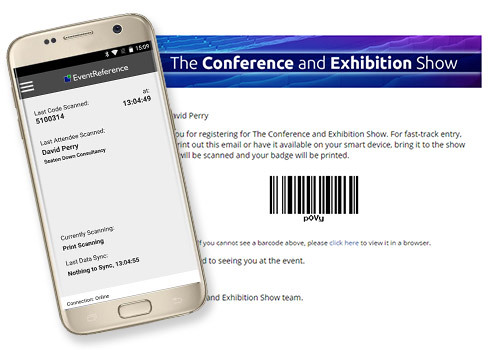 Using the scan and print feature on the WebScanning app, simply scan the e-badge barcode and the attendee’s badge will print out at the designated printer. Fast, easy, efficient. 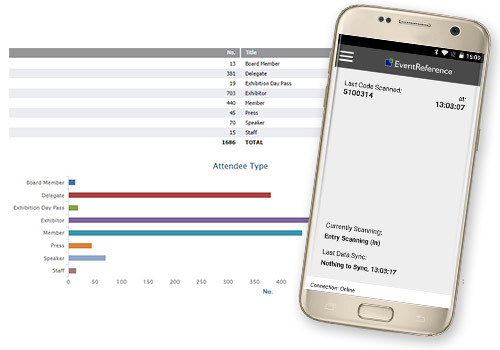 Get attendance reports post event with the Attendance Scanning feature. As you hand out your badges at the registration area you can scan each one, or if you have sent the badges out in advance you scan everyone as they enter your event. This will provide you with an attendance report post event. You are able to access your reports at any time using your EventReference login and clicking on the reports list. Find out who attended your events. Use the Session Scanning feature of WebScanning to easily find out who has attended sessions during your event. It's easy and hassle free. Just follow these steps. For data to sync between the scanning app and the EventReference server an internet/3g mobile connection is required. Whilst offline, scans will be recorded and saved so when connection is restored all data is synced automatically. For scan and print functionality a reliable internet/Wi-Fi/3g connection is required at all times.